A vibrant and colourful stacking toy that really appealed to our little testers. Slotting the pieces onto the rod develops hand-eye coordination, and with practice (and at times support), the children were able to progress their ability to do this. The children enjoyed both putting together and taking apart the toy. This benefits their spatial awareness and problem solving logic as they can learn about how things fit together. Older children talked about the colours, textures and patterns and discussing the shapes, which promotes colour and shape recognition  ideal for preparing for pre-school learning. Children were required to use their skills of observation to sort the shapes by size and put them back in the correct order, which also builds concentration and attention. This suited older childrens progress well, while the fact that the shapes could also be put on in any order, allows for creativity and imaginative play and suits younger children. The Giraffe Stack & Play is the perfect toy to help develop those really important spatial and motor skills. 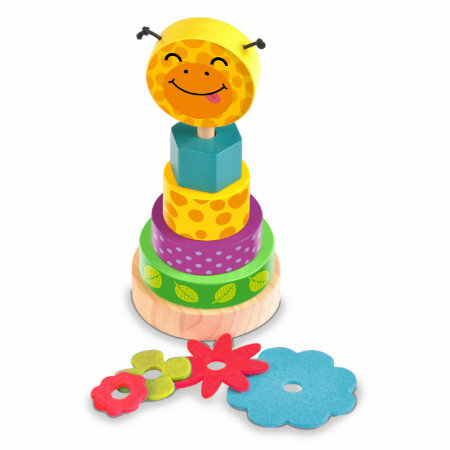 Suitable for babies 12 months and older, the Giraffe Stack & Play combines wooden stacking rings with colourful flower-shaped fabric pieces allowing children to get creative with stacking and sorting! Stacking and re-stacking the pieces will help young children to develop fine motor skills, whilst sorting them by size or shape encourages spatial awareness. Children will adore the familiar friendly face printed on the wooden piece and will love that they can see a different expression when they rotate it. By creating different stacks using the wooden and fabric pieces children will develop a greater understanding of shape and size, and how they interact with each other. They will enjoy stacking the pieces by size, colour, or material and have fun being creative and playing with the Giraffe Stack & Play.